Come hang out at the January Phlocking this Friday at the E-Club as usual. Convening at 7PM we can share Christmas and New year’s Eve stories. I’m sure there will be laughs and leftover holiday cheer! DJ Robbie Jones will be spinning some tunes, free food buffet as usual, and some beer specials. Remember to bring some cash to pay your dues (still an inexpensive $10 annually) for 2015; this allows us to update our rolls for reporting membership to national and we won’t have to keep bugging you, haha. We look forward to seeing everyone there, have a Happy New Years celebration and everyone be safe. 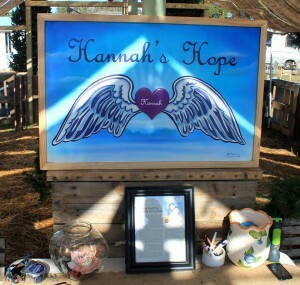 Our parade winnings of $250 were donated to Hannah’s Hope. 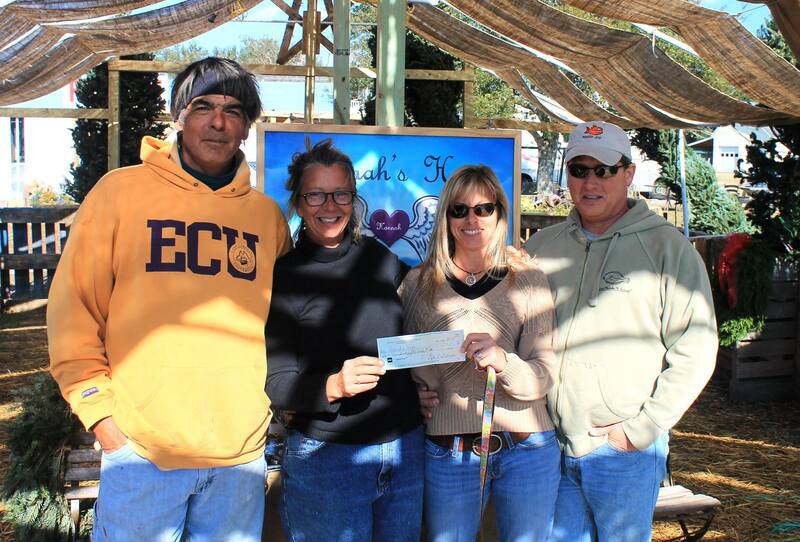 They were so grateful for the donation as they just received their non profit 501c3 status. The money they raise for their new organization goes to needy children. 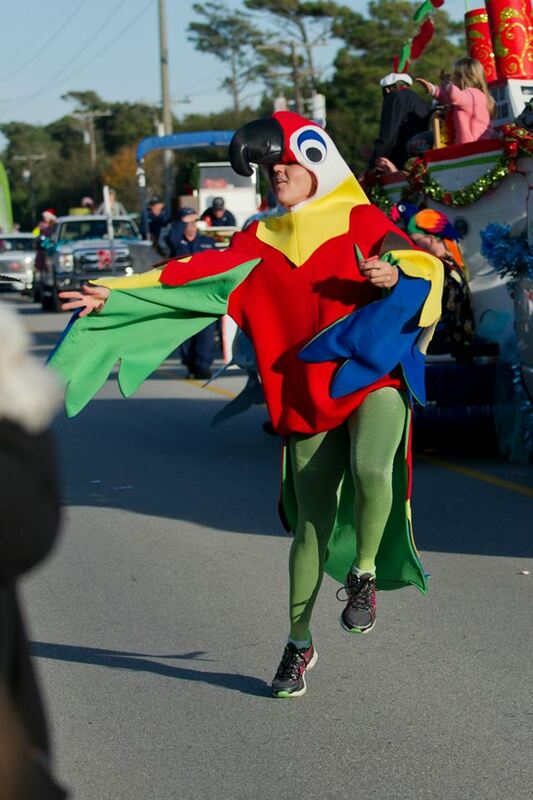 Since Kelley and Erin were the “big birds” (organizers) of the parade float, we asked them to pick the charity. Erin and Kelley table at Salty Air Market in the summer and so know the family and their story well. We will try to follow what they do with their organization for the future. They are still selling Christmas trees at the Salty Air Market in Cedar Point, $5 from each tree goes towards Hannah’s Hope. 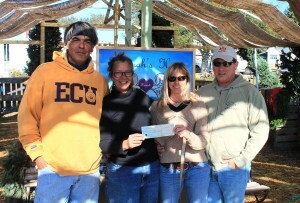 Renee now has $680 from Parrot Head donations that she and her elves will use to shop for 5 needy families. What a generous group of folks we have! Merry Christmas all. Great PHlocking on the 5th, got to see a lot of folks we had not seen in a bit. 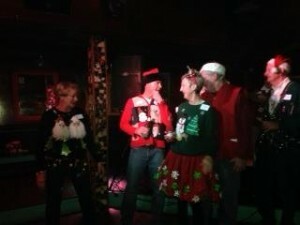 We raised $543 for the needy families that will be shopped for by Renee and her elves. Thanks so much for being such generous Parrot Heads. 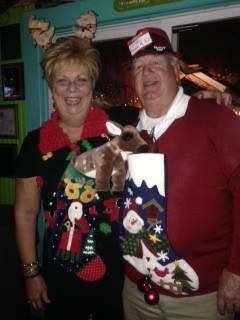 The ugly sweaters were awesome. Three finalists, Tara, Marsha and Clyde pictured here. Merry Christmas all and you helped make a better Christmas for 5 families. The “S.S. Parrot Head” takes first prize! The SS Parrot Head took first place in the Non-Profits in the Emerald Isle Parade on Nov. 29th. 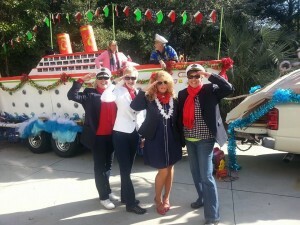 There was lots of fun and good food at numerous work parties to build our cruise ship all fall. Special thanks to Kelly and Erin for their vision, and planning and organizing things. Our $250 prize will be donated to a brand new non profit 501c3 Hannah’s Hope that will provide all kinds of help to underprivileged kids in our area.